…I mean why don’t I own a camcorder. We are currently about 3 weeks out from the opening night of The Odd Couple and I dropped my former co-director now set designer, Holly, off at the airport the night before the dreaded day on the calendar that reads ‘Off Book’. That’s right. Cue the ominous music. I promise you, when Holly printed off the calendar – pre-landing an actual paying theatre job – those words really were printed on May 24th with the scenes for the day. However, as I know from the world of UX, people don’t actually read the things you send out. Well, some do, but they’re a rare breed. Anyway, as I’m sure is no surprise to anyone familiar with The Odd Couple, the members of the cast are all characters in and of themselves. So when on Monday started a bit late; even before Desirea laid claim to all of the scripts for the evening it was apparent it would be interesting. Murray freely admitted he didn’t have his lines all memorized and several of the other poker players weren’t far off. I don’t think they believe us that we would take them away. This is not to say they lacked awareness of their lines. Murray would on many occasions stop, look to our stage manager and simply state it was his line but he didn’t know what it was. Roy actually raised his hand on at least one occasion as if back in school to request his line and Speed, well, Speed has awesome ad libs. Speed is 92 years old and a long veteran of community theatre. He told us he knew two lines, which wasn’t precisely true, and by the end of the night he literally had us laying our heads on the table laughing. Neil Simon is a genius, but I almost wish I could let Speed loose from the script to ad lib his way through. My favorite of the night was when he went off on a rant about Felix and chocolate guns and how you could never trust any of Felix’s stories. I can assure you that there is nothing in the actual script about chocolate guns. Really there is not, but you would have believed there was by the straight, earnest disgust Speed gave the line when he said it. Fast forward to Tuesday night or the date with the Pigeon sisters from upstairs. The Pigeon sisters have a tendency to giggle even when they aren’t in character, so you can only imagine what it’s like when something strikes them funny on stage. Case in point – Gwendolyn is the empathetic sister. Cecily is not so much so. Cecily is also apparently fond of snack foods. So when Gwen accidentally ended up with the fictional bowl of potato chips in the middle of Felix’s breakdown it seemed only appropriate that she pass the bowl oven the sobbing Felix to her sister, so that Cecily could eat the chip as written in the script. If that were not bad enough, when I reminded them that this was a very serious matter, Gwen decided that she must have dip to go with the very serious chips thus yelling across the stage that dip; they needed dip. It spiraled downhill from there. All that Boy Scout first aid training really does come in handy from time to time. 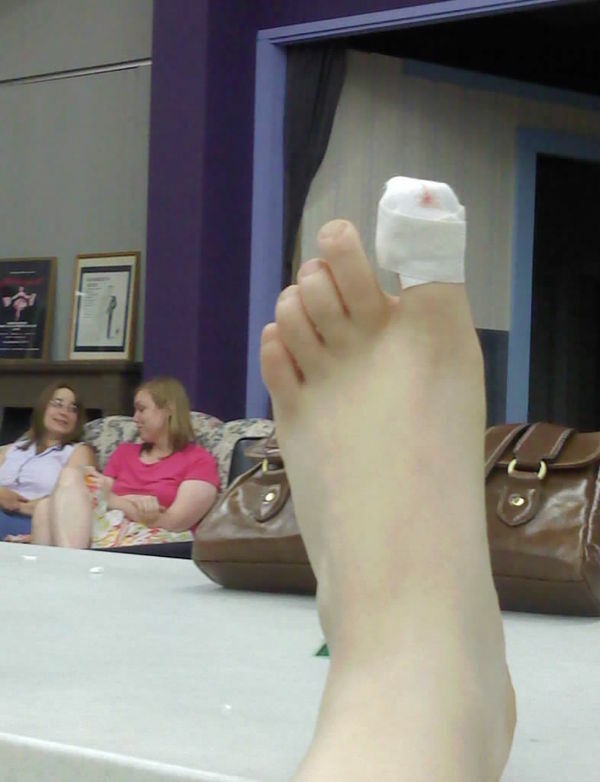 I’d post a picture, but my stage manager agreed that might be a bit gruesome. She has also dubbed that toe the ‘bad’ toe’. It seems a bit unjust considering the toe was just an innocent bystander. If this is the first week off book I can only imagine what the next few weeks are going to bring. Previous Blingo! Next What’s in a Name?